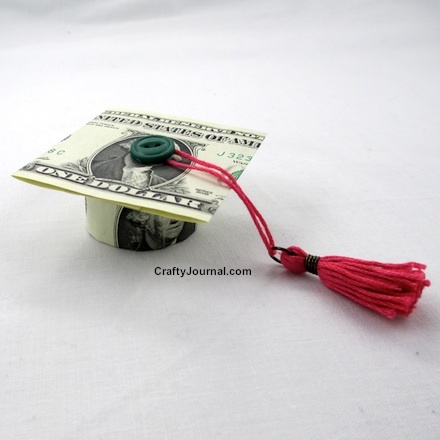 For a fun grad gift, make this creative Dollar Bill Graduation Cap. You can use bills of any denomination, and it’s sure to please the new graduate! If you’re having a graduation party, these would make great favors. And don’t forget to make the tassels in the school colors! 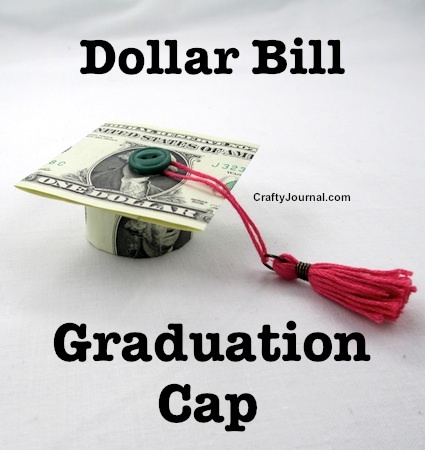 How to Make a Dollar Bill Graduation Cap. 1. Fold the first dollar bill into thirds length wise. 2. Roll the folded bill into a circle and put one end of the bill inside the fold of the other end. Slide the end in until the circle will fit snuggly around the milk jug cap. 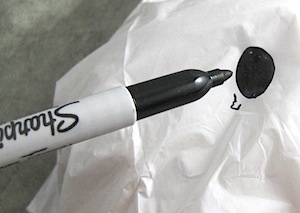 Insert the cap through the bottom of the ring, and push it up until the top of it is even with the top side of the circle made by the dollar bill. 3. Using the second dollar bill, fold both ends under until the bill is about 2 1/2 inches wide, which will make it a square. Try to center Washington (or the face on the bill). 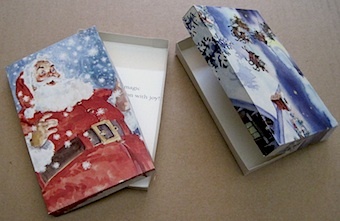 Crease the edges sharply, and put a small bit of double sided tape under the end which is on top to hold it flat. 4. Put a little of the double sided tape on the top of the bottle cap. 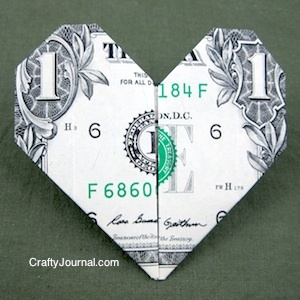 Center the dollar bill square over the bottle cap and press it onto the tape. 5. Make a tassel in the school colors with embroidery floss. Thread a piece of floss through the ring at the top of the tassel and tie it into a loop. 6. Use double sided tape or a dot of hot glue to attach the end of the loop to the center of the graduation cap, and then attach a button over it. I didn’t need anything to hold the circle in place around the milk jug cap because the ends overlapped quite a bit. You should be able to carefully remove the tape / hot glue from the dollar bills with a bit of gentle rubbing. LOVE this idea and may use it, as my nephew graduates high school very soon. I love the idea of filling the jug with quarters for laundry and other quarter necessities! It might have to be a quart jug, though, as a gallon jug full of quarters would be VERY heavy! Ha! What a clever idea – and I bet they’d like a FIFTY even better! 🙂 Very cute. Love it. I love these! What grad wouldn’t want one of these? The bigger the number the better! I am pinning! This is one of the best graduation ideas I have seen! These are so neat! I saw your link over on The Mommy Club linky party and had to stop by to tell you how much I like them. pinning. This is adorable and a wonderful idea for graduation celebrations! I love these graduation caps! They are so creative and absolutely perfect for any graduate. Such a cute idea! I’m going to pin this and to make for my daughter’s graduation from 8th grade! Thanks so much! What a great, quick idea! Hi There, I’m a cohost for Wake Up Wednesday. This is super neat idea. My mom is a teacher and I will share this with her. I will also keep it in mind for all the graduates I get an invite from. This is so cute! Thanks for posting. Hello from Motivation Monday. So cute, Noreen! I’ll be using this this week. Thanks for linking up at the party. I’m featuring you! Brilliant and just adorable! Craft schooling Sunday will be back, after a month long break, this sunday, hope to see you there!